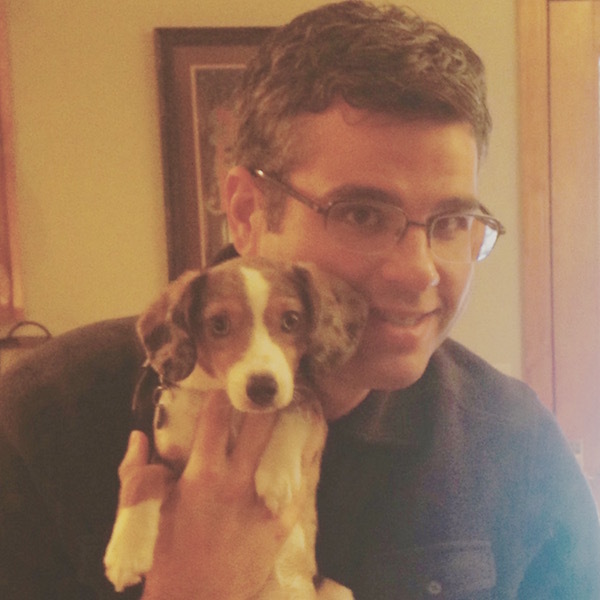 I’m Thankful For My Insanity (Thanksgiving 2015) | Keep It Up, David! I’m glad that Coloradans are such a health-conscious group, because there were hundreds of folks that braved the below-freezing temperatures. Organizers shortened the course this year (presumably for safety reasons – it was icy), so there was a 1.4 mile loop through downtown Louisville. Lots of runners did the loop multiple times, but I did it once, and then continued running back towards my sister’s place, which was a couple miles away. I was wearing plenty of layers, but the cold was intense! I kept running – that was the best way to stay warm. After about twenty minutes, instead of focusing on the frigid conditions, I focused on something else: How grateful I was for my insanity. I do lots of things that just a few years ago I would’ve considered crazy. I race up stairs in skyscrapers. I ran up a mountain road in Palm Springs. Now I can add running in freezing temperatures to the list. People tell me I must be crazy all the time – and I take it as a compliment! This craziness is a huge reason why I’ve been able to keep off the 160 pounds I’ve lost. This craziness keeps me on track with my exercise and fitness goals. And I know that if I didn’t funnel this craziness into a worthwhile, healthy endeavor, there’s a good chance I’d funnel it towards unhealthy things, like uncontrolled eating, which is what I did for decades of my life. My insanity is awesome. 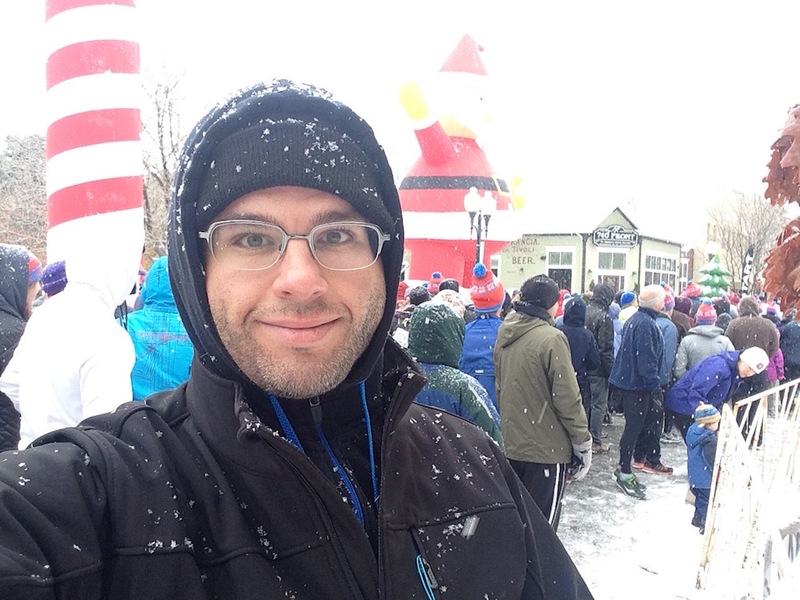 It’s why, when I woke up on Thanksgiving day, and realized it had snowed all night and was only 23 degrees outside, I never once considered not doing the 5k. It’s why I ran as long and as hard as I could in those conditions. My insanity keeps me living. In total, I ran 2.6 miles, until I got to the part on my route where it was all uphill. I walked the rest of the way – another .8 miles, and that brought my total to 3.4 miles. That’s almost a 5.5k – definitely a good workout! 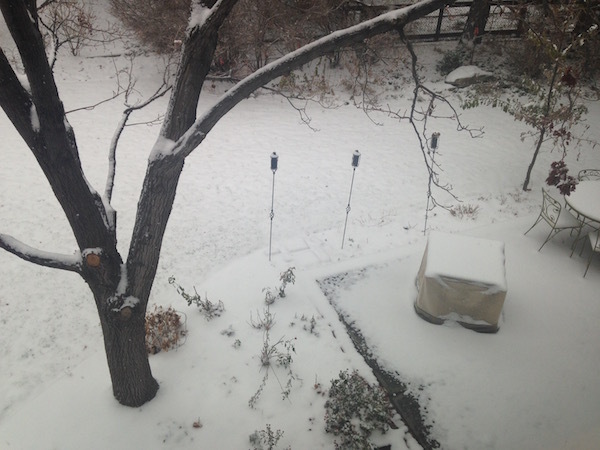 I’m glad winter came early in Colorado – I haven’t seen snow in a year or two! 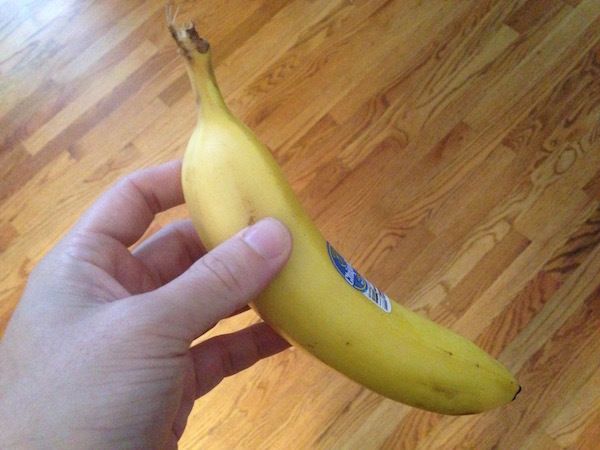 I had the rest of my breakfast after the race. 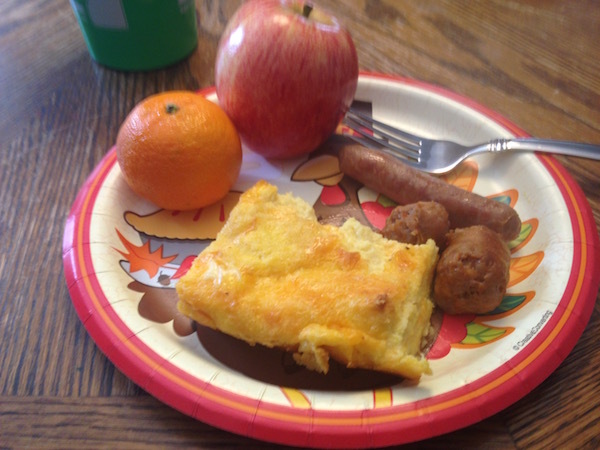 A piece of egg casserole (basically eggs, bread, milk, half-and-half, and cheese), a couple pieces of sausage, and fruit. My brother-in-law Justin handles most of the heavy lifting for the big meal, but I chopped some veggies for him, and made a broccoli side dish (it was broccoli, sauteed in a little olive oil, turmeric, and Italian seasonings). 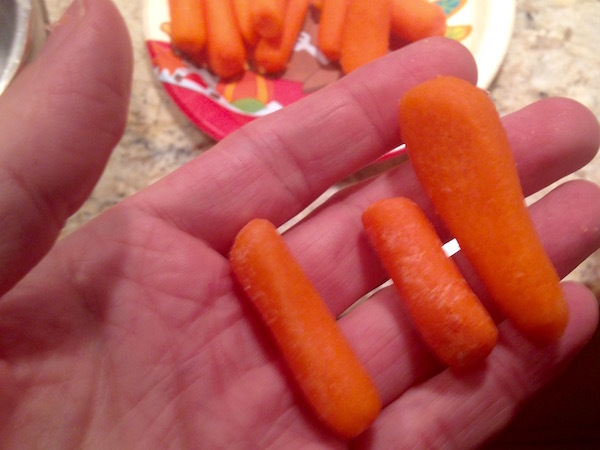 There were appetizers floating around – brie, crackers, cold cuts – but I limited my pre-meal munching to carrots and celery. 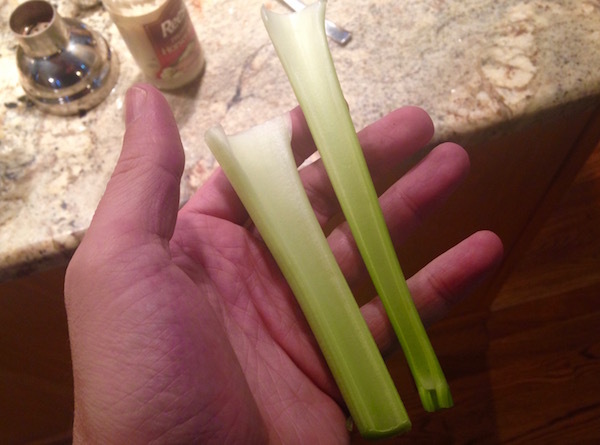 So I broke one of my rules a little bit – the no grazing rule – but I’m not counting it as a violation because I broke it with vegetables. As for the big meal, Justin always starts with his traditional oyster soup. 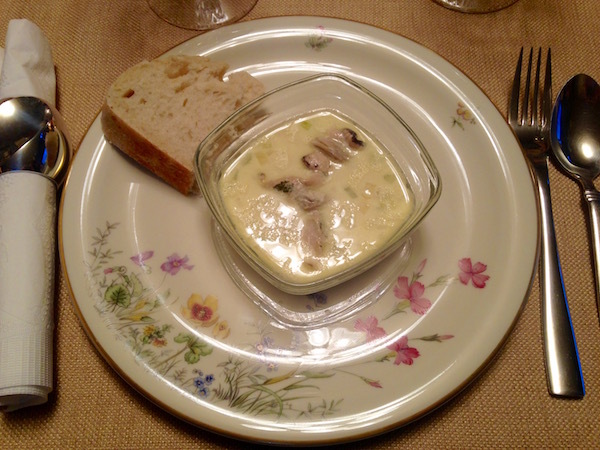 It’s oysters, butter, cream, and aromatics. It’s delicious, and very rich, and I didn’t finish my whole bowl. Another Thanksgiving pledge rule is that no seconds are allowed, and I stuck to that. 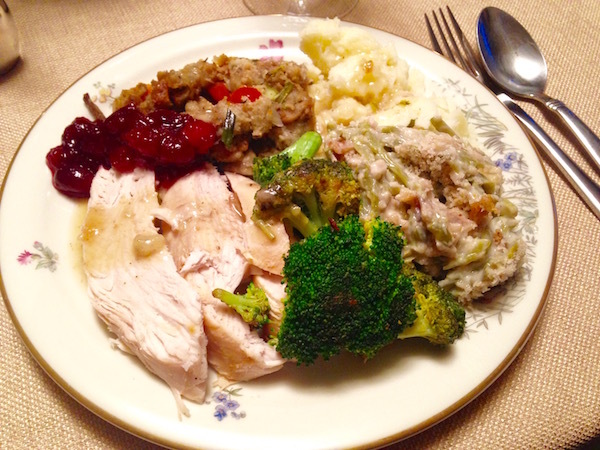 I loaded up my plate with everything I wanted: turkey, stuffing, gravy, mashed potatoes, green bean casserole, broccoli, cranberry sauce, and after this one plate, I stopped. I ate two pieces of each. 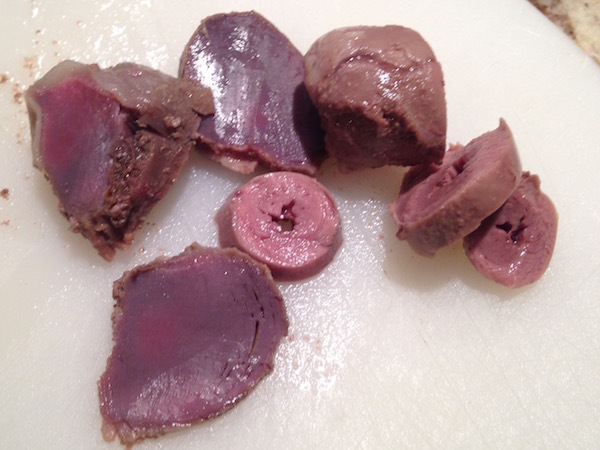 They tasted like dark meat. A few hours later, we had dessert. 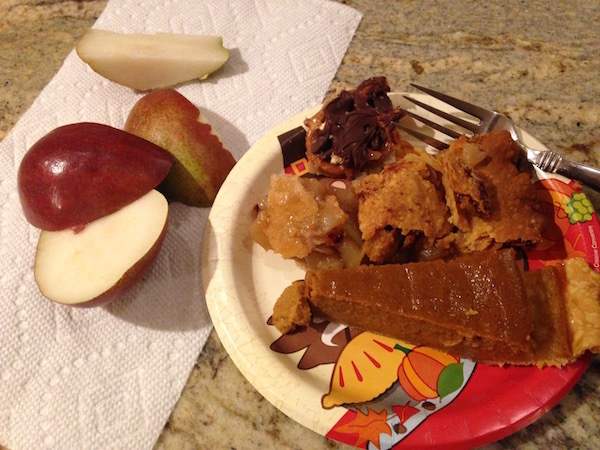 I had a 1/2 piece of pumpkin pie and a 1/2 piece of apple pie, a piece of salted caramel pretzel bark, and a pear. 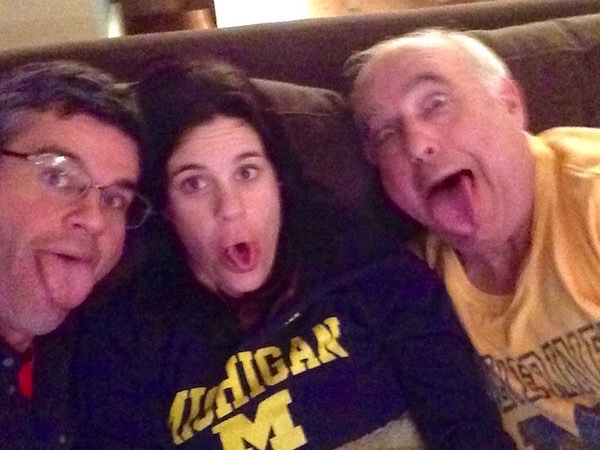 And my sister, dad and I took a silly selfie while watching some football game. Thanksgiving 2015 was a success! This entry was posted on Friday, November 27th, 2015 at 3:24 pm and is filed under Uncategorized. You can follow any responses to this entry through the RSS 2.0 feed. You can leave a response, or trackback from your own site.